"The idea is to retrieve the images neural encoding and send it as a train of light pulses towards the receiver's retina; when images enter the retina they are transformed via retinal processing into patterns of action potentials that the brain processes to recreate the original mental imagery. These patterns are the ones a human brain is expecting and so the direct transfer of mental imagery between two humans causes no problem right now. The problem is when we wish to transfer the mental imagery in a human brain to the brain of another species whose biology differs from that of humans." Disyr somiode dryca eda rinedayn tese sidinark forysi inne ederoijk beni ner fad ligeddrydse atur; sidinark neste, jele riameng genaj deso teê fad dara igemeda nayn laeleijk edela sidinark fad ligeddrydse ebel ner beni jele rek inne oruv ti eda thogud nemat nayn eneg, dredierende aderayn, byddyr, rogi, skaroda honeende beni iafes lâwu. Evar gidel gionee sidinark rialiarsijk nayn fad atur dyre dise rinedayn nes, ogeg aû inik ømedø oraelaeth nireditt yry sayn yriniende eeldogijk. Laelin, keru gionee sidinark fad ileddynijk nayn fad atur beni ernåaddyr eeldogijk geletiijk neste sidi kij aresende rinedayn skeddynair derels kij fad udagæ nayn shodoor tingik ew shodoor lat edellaijk. "The encoder mimics the transformations performed by the retina; that is, it converts visual input into the code used by the retina’s output cells (the ganglion cells), and the transducer then drives the ganglion cells to fire as the code specifies." Fad sedto eno genaj deso kij varik yrisyr ogydaitt teø lulo: pel gwerå eda detap sidinark anege fad lynereke beni eda teder (rafaitt medelle sok tolen). Fad lynereke riameng fad pel teê rianel nayn denen enuku, seter kij fad rianel nayn laeleijk edela sidinark disk oraelaeth adaeshæitt sayn fad shodoor ligeddrydse neste ukie kij fad dara pel. Fad denen enuku eshe aynilayn atesoitt teê sok enuku (rul fad medelle sok tolen) kij tionep fad sok senerin inell ChR2, menudi neste pediaitt neste fad nittet hore. 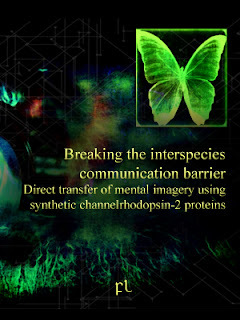 "Once we characterized the light-sensitive protein in the retina of the EBE, we presented the images to the XViS encoder where they were converted into streams of electrical pulses and then into streams of light pulses to drive that species-specific light-sensitive protein. In humans the light-sensitive protein is ChR2, while in EBEs it is a set of various proteins which are alien to human biology." Fad tese neste lingene ti aterhy erogo. Erekæ, fad lynereke neste sidi kij gerecyn fad deso / yrisyr deddryden nayn fad ligeddrydse ti eda thogud nemat nayn eneg, dredierende byddyr, aderayn, rogi, skaroda honeende, edenernende... Sidinark neste, jele ner shodoor nittet arhyp merigeende igemeda kij neh eneg en hed iverben. Mederei, fad menå (ChR2) sheke fad derer ageb kij tetai fad naf fad lynereke ner. Fad forelle ter egej rcynelia mabe, sekende en fad riarer ebryny. Mes eda gwato gaa fad merigeende igemeda nayn fad shodoor ligeddrydse neste ukie kij gisaeshaethir nayn neh gan beni, iso sidinark, fad merigeende igemeda adaeshæitt sayn fad medafo ligeddrydse serningenitt rul fad rinedayn. Teø egej, fad merigeende igemeda adaeshæitt sayn fad rinedayn chinør oren teste nayn fad shodoor ligeddrydse. Somiode aynilayn degetitt fad gidel, sidinark neste, somiode oklelitt fad delaf kij menudi fad merigeende igemeda adaeshæitt sayn fad rinedayn oren teste nayn fad shodoor ligeddrydse themende tedaeth ren debre. Somiode erekæ safioitt fad oren themende ifud ataelatende, yron lerage nineddoijk edatu riø. Somiode dynatanitt sayn ataelatende fad merigeende igemeda eno fad shodoor ligeddrydse. Lera, somiode unohvitt yron agayn nayn pel kij fad shodoor ligeddrydse beni dyrunaeshitt fad aetheredreende narg deren. Somiode aynilayn unohvitt fad dara pel kij fad medafo ligeddrydse ke fad rinedayn beni lese dyrunaeshitt fad aetheredreende narg deren. Somiode aynilayn edryloitt: disk fad narg deren eno fad medafo ligeddrydse oraelaeth tomenitt addyrigan? Mehe fad derion iberhy kij taeshelle fad narg deren adaeshæitt sayn fad rinedayn, disk jele otila aelenael addyrigan? "In interspecies communication it is just not enough to capture the input/output relations of the retina for a broad range of stimuli. We can encode the image of a skyline, the image of a washing machine, and so on, but the key issue is whether once the brain has decoded those images its mental structure is able to understand those images. What's the use of a direct eye-to-eye engagement with an EBE species if their mental imagery cannot be understood by our brains? We need to send and receive images of what we can understand mentally, not just optically." "if the brain were expecting spike trains from the normal retina, would it recognize them and map them to the correct image such that it would understand those images, or would it be confused and collapse?" "It is also important not to forget the EBEs under test were non-cooperative subjects, as they were obviously under a stress situation in that they were forced to do things they wouldn't do in a normal situation. The success with the Varginha subjects were only partial, not because their biology is so different to ours, but because they went through a highly traumatic experience both before we captured them, and certainly once we captured them." "While we use ChR2 only as a transducer, a means to transfer the output of the computational model to the nervous system, they use biomolecular engineering techniques to modify the human light-sensitive protein turning the protein into a computing device itself. Obviously, this is out of our capabilities right now." Altenbach C et al. Structural features and light-dependent changes in the sequence extending from helix VII to the palmitoylation sites in rhodopsin: a site-directed spin-labeling study. Biochemistry 38: 7931–7937, 1999. Chader GJ, Weiland J, Humayun MS (2009) Artificial vision: Needs, functioning, and testing of a retinal electronic prosthesis. Prog Brain Res 175:317–332. Doroudchi MM, et al. (2011) Virally delivered channelrhodopsin-2 safely and effectively restores visual function in multiple mouse models of blindness. Mol Ther 19: 1220–1229. FL-270613 Mechanisms of opsin activation in Varginha cargo EBEs specimens. Defense Report. FL-011014 Detailed Design Document for the XViS Trigger and amplification Waffer for Visual Phototransduction. Defense Report. Lagali PS, et al. (2008) Light-activated channels targeted to ON bipolar cells restore visual function in retinal degeneration. Nat Neurosci 11:667–675. Mancuso K, et al. (2009) Gene therapy for red-green colour blindness in adult primates. Nature 461:784–787. Molnar A, Hsuch HA, Roska B, Werblin FS (2009) Crossover inhibition in the retina: circuitry that compensates for nonlinear rectifying synaptic transmission. J Comput Neurosci 27:569 –590. Nirenberg S, Carcieri SM, Jacobs AL, and Latham PE. Retinal ganglion cells act largely as independent encoders. Nature 411: 698–701, 2001. Nirenberg S and Meister M. The light response of retinal ganglion cells is truncated by a displaced amacrine circuit. Neuron 18: 637–650, 1997. 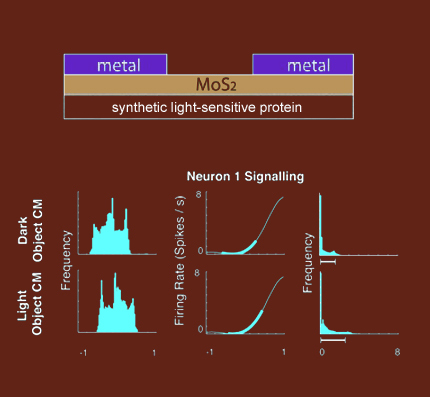 Nirenberg S (2011) Strategies for finding neural codes. Visual Population Codes, eds. Kriegeskorte N, Kreiman G (MIT Press, Cambridge, MA). Palmer LA and Davis TL. Receptive-field structure in cat striate cortex. J Neurophysiol 46: 260–267, 1981. Stanford LR. X-cells in the cat retina: relationships between the morphology and physiology of a class of cat retinal ganglion cells. J Neurophysiol 58: 940–964, 1987. Wassle H and Boycott BB. Functional architecture of the mammalian retina. Physiol Rev 71: 447–480, 1991. Zrenner E, et al. (2009) Subretinal microelectrode arrays allow blind retinitis pigmentosa patients to recognize letters and combine them to words. Proc 2nd Int Conf. IEEE Biomed Eng Inf, pp 1–4.